If you happen to be visiting Portree, the main settlement on the Isle of Skye, the chances are that you will take a wander down to the bay where in the flurry of tourists and opportunistic seagulls, it is easy to miss a plaque on a white-washed wall with the Gaelic words: ‘Moch ‘s mi ‘g èirigh, / air bheagan èislein, /air madainn Chèitein / ‘s mi ann an Òs’ (As I rose early, / with few cares, /on a May morning / in Ose). 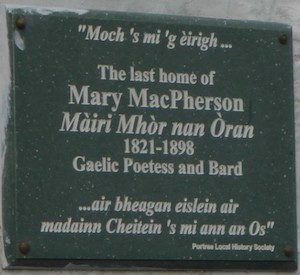 The plaque marks the house in which the Skye poet, Mary MacPherson, more familiarly known in Gaelic as Màiri Mhòr nan Òran (Big Mary of the Songs), died in 1898 at the age of seventy-seven. The crofting township of Ose mentioned in the lines quoted, is on the west side of the island, on the shores of Loch Bracadale. The topography of this girth of land between Portree and Ose, marked by the prominent rock pinnacle of An Stòr on the east side and the two distinctive flat-topped MacLeod’s Tables in the west, is referenced in many of Màiri Mhòr’s songs through resonant associations that nourished her sense of place. Although Màiri Mhòr lived for a large part of her adult life away from Skye, her ‘glorious pride’1 in her native island permeates her poetry in no small measure. In Gaelic poetic tradition it is not unusual to signify place by means of historical or mythological association, but in Màiri Mhòr’s understanding the most deeply felt place connections were those recalled from her lived experience. Her cartography of place is a peopled landscape: its topographical features and vegetation symbolic of the community and culture that she knew in her youth, and these personal and communal associations have a fervent emphasis in her songs. In his well-known essay entitled ‘The Sense of Place’, Seamus Heaney discusses a close connection to place as an influence that ‘steadies’ and informs a ‘point of view’.2 These terms seem particularly apposite in reflecting on Màiri Mhòr’s relationship with Skye as both bedrock and touchstone, and in understanding the central place the island has in her poetry. It is that two-fold dimension that I would like to hold on to here in exploring the sense of place in the poetry of Màiri Mhòr nan Òran. If a sense of place nourished by the memory of her early years in Skye provided a steadying lyrical seam in her songs, it was from her personal experience of humiliation and injustice that other vital strengths emerged. In the spring of 1872, in her early fifties and recently widowed, Màiri Mhòr was accused of stealing a shawl from a house in Inverness where she was employed and as a result received a prison sentence in court, although there is nothing to suggest that this was anything other than a miscarriage of justice.3 In her anguish and distress at this time, when she might otherwise have collapsed mentally and physically, the sudden awakening of her poetic voice, shaped in the rich Gaelic song-making tradition of her young days in Skye, became the means of her salvation and empowerment. / There was not any English-speaker in the service of the Crown / Who would look on me unjustly). In the same song, she expresses her bewilderment that anyone could think that she would shame her people on account of a rag of old clothing: ‘Dhol a nàrachadh mo dhaoine […] Air son clùdan a sheann aodach’.6 Her own reputation and the reputation of her people were one and the same, and ‘mo dhaoine’ encompasses both a specific (her people in Skye) and a generic (Gaelic-speaking) understanding. Gun spùinn iad uainn le lagh an fhearainn.7(In the area commanded to us by God, / We are not allowed to journey on hillside or shore, / Every single thing that was of value, / They plundered it from us by the law of the land). And the kindliest women, / of conduct most mannerly, / their skulls were broken / On the braes of Beinn Lì). Dh’aindeoin innleachd nan daoi.9(Prison is a good college — / I myself recognised that long since — / But the truth will triumph, / Despite the ingenuity of the wicked). It is, however, in her songs of place reflecting on her early life in Skye that Màiri Mhòr’s lyrical voice is most attuned to her subject. In the best of these songs she is bearing eloquent witness to the place and the community from which she grew and which sustained her through the storms of life. Her songs of this genre are often elegiac in tone at the start, but this is seldom maintained as she draws new energy and hope from the intense feelings aroused by familiar and significant places. Dh’fhalbh na strìochan às mo mhala. (Though my head has greyed, / And my locks turning white with age, / On reaching Eilean Diarmaid, / the lines disappeared from my brow. When I saw the peak of Glàmaig, / The side of Ben Lì and the ridge of Màrsgo, / I imagined that I grew strong, / with the fresh air from the mountains). (I arrived at Tobar-a-Mhàil, / Where I frequently drank my fill, / Scallop shells at its bottom, / and today it is so full of sediment). (I dried my tears then, / and began to sing my songs, / To keep my mood in check — / There is at times danger in sorrowing). Relieved of her melancholy, Màiri Mhòr is able to contemplate past and present in a much more sanguine and determined frame of mind, as she continues her pilgrimage to specific places that refresh her memory of the people she knew and the social activities she enjoyed there. (Wandering the moor in search of sheep, / and I was as light as a snipe on the marsh, / each mound, bog and marshy hollow, / bringing to mind my youthful self). Màiri Mhòr’s personal topography of place as described in this song is of moor and glen, a terrain of mossy hummocks, heather, and still lochans: the habitat of snipe and skylark, and the familiar wild flowers whose names she recites as if to ensure that they have not gone from her memory. This is not a fanciful pastoral (although Màiri Mhòr is not by any means immune to slipping into that tone at times) but rather a narrative of resonant familiarity: a landscape that was walked and known in all its intimate detail, and where in her own memory, there had been a population and a way of life closely connected to the land. In the same breath as she records the pastureland gone to heather and rush, she recalls her younger self making sheaves there at harvest, and in noticing the houses falling into ruin and overgrown with nettles, she can name the people who had lived there. However, in reiterating the standard imagery for a displaced and departed population that occurs in many nineteenth-century Gaelic songs, Màiri Mhòr is reluctant to fully accept the implied prognosis: ”S nam faicinn sluagh agus taighean suas annt’, / Gum fàsainn suaimhneach mar bha mi òg’. 15 (If I would see people and houses back up there, / I could feel tranquil as I was in my youth). The theme of recovery and renewal, a note of defiant confidence in Màiri Mhòr’s perspective on the Gaelic community in the last two decades of the long nineteenth century, owed much to her distressing experience in Inverness in 1872, a situation where the prospect of a positive outcome could not have seemed less likely. It was, however, the catalyst for a dramatic turnaround in her life, and she draws on the well-rehearsed trope from earlier Gaelic poetry, the wheel of fortune, to make sense of this: ”S e cuibhl’ an fhortain a dhol tuathal, / a chur mise anns a’ chruaidh-chàs’ (It was the wheel of fortune turning backwards / that put me into adversity).16 Just as the wheel swings ‘tuathal’, attracting misfortune, it can also turn ‘deiseal’ (sunward) bringing a providential change in fortune, as Màiri Mhòr experienced in her own life. Thus she is able in her song ‘Eilean a’ Cheò’ to confidently assert to those lamenting the loss of their people and their culture, ‘Gun tèid an roth mun cuairt duibh’17 (That the wheel will come around for you). Her close interaction with the land movement must also have encouraged her in this optimistic perspective, particularly as she was often present at Land League rallies where the passionate rhetoric of the speakers would have resonated deeply with her own response to land and place. The Gaelic poet Sorley MacLean in his long epic poem ‘An Cuilithionn’ written in the bleak years of the 1930s could find no sign that Màiri Mhòr’s hopeful outlook for Skye had come to pass: ‘Seachnaidh mi clàr treun a h-aodainn, / ‘s mo sgeul air buaidh ar n-Eilein traoighte’, (I will avoid her brave forehead, / as my tale is of the ethos of our island ebbed’).18 He would understand more than most how much she had invested in that hope, sharing as he did a vision of redemption for his people. As MacLean has noted, the poetry of Màiri Mhòr is uneven in quality and sometimes inconsistent in perspectives on certain landlords, but he also had great admiration for its passion and ‘brave optimism’.19 To admit that there are weaknesses in her songs is not to deny the strengths, and of these a sense of place, rooted in the land and life of her home island, has a vital and powerful resonance. Somhairle Mac Gill-eain, ‘The Poetry of the Clearances’, in Ris a’ Bhruthaich, ed. William Gillies (Stornoway: Acair, 1985), pp.48–74 (p. 71). Seamas Heaney, Preoccupations Selected Prose 1968–1978 (New York: The Noon Day Press, 1995), pp. 131–149 (p. 144). See ‘Eachdraidh a Beatha’ in Dòmhnall Eachann Meek, Màiri Mhòr nan Òran (Edinburgh: Scottish Gaelic Texts Society, 1998) pp. 23–27. Màiri Nic-a’ Phearsain, Dàin agus Òrain (Inverness: A. & U. Mac-Coinnich, 1891), p. 216. Henceforth DO. ‘Luchd na Beurla’, in Nic-a’ Phearsain, DO, p. 228. ‘Luchd na Beurla’, in Nic-a’ Phearsain, DO, p. 229. ‘Òran Beinn Lì’, in Nic-a’ Phearsain, DO, p. 111. ‘Òran Beinn Lì’, in Nic-a’ Phearsain, DO, p. 113. ‘Ath-Ùrachadh m’ Eòlais’, in Nic-a’ Phearsain, DO, p. 192. ‘Soraidh leis an Nollaig Ùir’, in Nic-a’ Phearsain, DO, p. 16. ‘Soraidh leis an Nollaig Ùir ‘, in Nic-a’ Phearsain, DO, p. 17. ‘Nuair bha mi òg’, in Nic-a’ Phearsain, DO, p. 29. ‘Eilean a’ Cheò’, in Nic-a’ Phearsain, DO, p. 7. ‘An Cuilithionn’ in Caoir Gheal Leumraich, ed. Christopher Whyte and Emma Dymock (Edinburgh: Birlinn, 2011), pp. 372–373. Somhairle Mac Gill-eain, ‘The Poetry of the Clearances’, in Gillies, pp. 48–74 (p. 74). Priscilla Scott is affiliated to the Department of Celtic and Scottish Studies at the University of Edinburgh, where she completed a PhD in 2013 on Women in the Gaelic Movement, 1886–1914. Her main research interest is concerned with women’s participation and perspectives in Gaelic literary and historical contexts of that period.